The assertive Ox, in alliance with the stubborn Aries, acquires even greater self-confidence. People of this combination of signs have their own opinion on everything, and the only true one. Proud, ambitious Ox-Aries do not recognize any authority. Therefore, one should not even try to argue with them, it is much more reasonable to listen to their advice. These smart, purposeful people know what they are doing. They are few-sided, calm, reasonable, in every movement there is a strong confidence in themselves. Aries-Oxen create the impression of balanced people, not prone to eccentric actions. Although actually quite emotional, rather even impulsive people. Much in their actions is determined by circumstances. 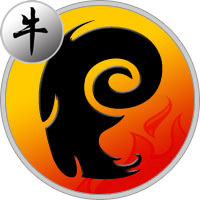 Powerful Aries-Ox strives to take the leadership position wherever it appears. Likes to give advice and guide people. Of course, he will not intrigue, but will directly declare his rights. This is a very calm, even sluggish person, most of all appreciates stability. The energy of Aries is manifested exclusively in solving business issues, and in everyday life this is the most peace-loving being in the world. Distinguished by a kind character, friendly and flexible, until his interests are affected. Enraged Ox-Aries can become completely unmanageable, but this requires really serious reasons. Usually he tries to keep himself in hand: he is too focused on the result, to be nervous about trifles. Aries-Ox does not seek support and compassion, is quite capable of coping with his problems on his own. Possesses iron restraint, perfectly supervises the actions, therefore another’s advice (councils) only irritate it. Sometimes he lacks the flexibility, he sets people against himself with excessive straightforwardness. He does not know how to obey, especially to pretend and intrigue. Ox-Aries is an extremely honest and principled man. Rather, she will choose solitude, than she will communicate with unpleasant people. He respects and values ​​himself too much to waste his life. This is an amazingly solid and harmonious personality. Although sometimes the Ox-Aries makes reckless acts, which immeasurably surprises others. The stubborn Aries-Oxen sometimes seem limited to humans: they are so focused on the result that they do not notice anything around. Boldly risk not only their reputation, but also their financial situation. Ox-Aries are not able to change their beliefs, always go to the last. Although they are quite sensitive people with a well-developed imagination. After all, the curiosity, emotionality of Aries exert a great influence on them. True hardness of the Ox does not allow them to turn out of the way, they always act strictly on the plan. In their honesty and devotion can not be doubted. People of this combination of signs, having made their choice, remain faithful to him throughout his life. Their main critic is his own conscience. The enamored Aries-Ox sincerely tries to please the partner. Immediately begins to act actively, not a drop does not doubt his own irresistibility. Aries-Ox can not be called a romantic, but it is quite capable of beautiful courtship. The truth at once will try to define the position: in attitudes (relations) it — the leader. Never get close to a frivolous person, not burdened with moral issues. Even a strong feeling will not make him give up his principles. In family life, Aries-Ox is the breadwinner and breadwinner, regardless of gender. All representatives of this combination of signs do not like to sit in four walls. But adore their work, so most of the time they spend outside the house. Of course, they love the second half, they show themselves as temperamental partners. Do not know how to express their feelings, prefer to solve pressing issues, and not to talk. They are quite capable of infidelity, they can not resist the possibility to escape from everyday life. For these people, the most important value in life is stability. Painfully perceive any change. They are horrified by financial problems and troubles at work, especially if the period of failure lasts a long time. Gradually lose confidence in the future, become quick-tempered and irritable. For the sake of material prosperity, they are ready to work from morning till night, it is important for them to achieve a high position. Aries-Ox never accepts a low position and a small salary. These hardworking people will always find a way to earn a comfortable life. Do not be afraid of the hardest work, agree to any conditions, but for the time being. The ambitious Aries-Ox sooner or later will occupy the chair of the head or become a famous media persona. Even if the path to the summit takes a long time, he will not be upset: the main thing is to reach the goal. True, there is a danger of getting physical and emotional exhaustion, after all, Ox-Aries needs more rest. The Aries-Ox man has a violent temperament that a combination with strong will make him almost invulnerable creature. Patiently and resolutely overcomes obstacles on his life path. In early youth can commit reckless deeds, but with age to replace impulsiveness comes a calm confidence in their abilities. Easily takes the highest vital strips, stubbornly advances along the career ladder. His goal is a good position, which guarantees a stable financial position. Women are very interested in Aries-Ox, but it is not easy to win his heart. The powerful partner demands complete submission. The chosen one should live by his interests, while being a passionate nature, capable of exciting the feelings of a temperamental man. Aries-Ox woman is not devoid of ambition, strives to take place in the profession. Acts quickly and decisively, any failure causes a feeling of irritation, and her energy is enough for personal life. Passionate, bright person attracts the attention of men, but makes them quite high demands. She craves love affairs, stable relations cause boredom in her. Easily gets connections on the side, if he does not receive the necessary emotions in the marriage. Intolerant of the partner’s weaknesses, jealous and willful. Will be happy with a reliable man, not devoid of imagination, capable of romantic madness for the sake of his beloved. Recognizes only an equal partnership, will not yield to the elect in anything, even household duties should be evenly distributed among the spouses.